The once rural community of Huntsford changed after World War II. In recent years, large segments of the population migrated from farms to the cities. Roads and highways spread like tendrils across the lush green prairies. Grazing land and farm country morphed into housing developments. The economic boom padded the pockets of young baby boomers. Their loose change fueled the coffers of the Esplanade Cinema like oil from a pipeline. I worked at the Esplanade. My walk to work took me across fields and pastures. Those walks reminded me of the farm where I lived and worked only a year earlier. In 1960 I cut and baled hay, herded cattle and did farm chores. Walks across fields on the edges of Huntsford brought back simple pleasures as the gentle breezes carried the sweet smell of fresh cut hay or the sounds of cattle lowing across the few remaining meadows. Yet this was a time and place for transitions. The end of my walk brought me to the Esplanade Cinema. It anchored the west end of our first shopping center. King Boy’s Burgers was right on my way to the Esplanade; across the street from the theater. The proximity created a mutual attraction, since both businesses benefited from the influx of customers. My mouth watered in anticipation of grilled burgers each time I passed by. I wonder how many folks drove to King Boy’s for burgers only to be lured into an evening of fantasy at the theater. At the Esplanade, good friends and a fair boss offered camaraderie and fulfillment. The theater was a wonderful place to work – close to home near places to meet and greet. You should have seen the place at night. It was like magic. 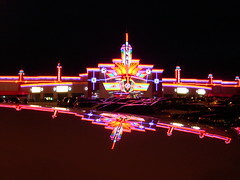 Glow of neon lit the marquee with brilliant colors; reds and yellows danced across glistening panels while a neon star crowned the very top. The star appeared to dance when illuminated – rising, falling and collapsing on itself between oscillations, like a rolling wave on the open sea; a hypnotic illusion created by masters of lighting. The cycle repeated until the theater shutdown for the night. The white marquee advertised the current attraction in letters we mounted one at a time – it took skill and patience to get the letters exactly where they belonged; each one placed on a long pole, lifted to the ledge and dropped in a groove. We nudged and adjusted the letter tiles into a secure spot where they remained until the next movie came along. Imagine posting a title like: The Pit and the Pendulum, featuring Roger Corman and Vincent Price. I entered the theater through one of four sets of double-doors. As I arrived one day my boss, Mr. Machen announced some errands for me to take care of across town. He took notice at my surprise when he gave me the keys to his 1959 T-Bird. My assignment – transport records to another theater and deliver a briefcase full of cash to the bank. After I finished the errand he gave me another one – take a purchase order to the Palace Theater and pay for seats their owner removed to make room for new ones. Esplanade could do without ‘designer’ seats. These older ones met the Mr. Machen’s approval without exception. His practicality and frugality always on display. The curtain rose every night like clockwork. It took a lot of hard work to get the Esplanade Cinema ready for the next show. Mr. Machen would hire a cleanup crew to take care of the really disgusting work: toilets, heavy vacuuming. People spilled drinks, dropped popcorn and candy wrappers anywhere: on the floor, in the seats, between the seats. Gum stuck to the bottom of seats like lumpy tacks. Don’t ever check to see. Trust me. You don’t want to find out. The cleanup crew didn’t mess around. Their heavy-duty vacuums and shampoo equipment attacked the maroon and black speckled Berber carpet extending from the entry to the dais under the movie screen. After the cleanup, the theater crew made a final inspection walking the aisles and checking between seats to ensure nothing was amiss spot cleaning as we went. Craig and I were ushers. Karen and Roberta worked as greeters and in concessions. The last few hours before opening changed priorities. Ticket sales were number one. No sales, no job. Jill, our ticket agent, worked the booth selling tickets. If she needed a break, the rest of us pitched in. Priority number two. Get the concessions area ready for business when our customers’ arrived. Several things occurred simultaneously; safety always paramount. We started by making popcorn because heating up the popcorn machine took time. Lift the kettle lid and add the kernels to boiling oil. This required extra care. Hot oil can cause third degree burns. The sound of the stainless steel kettle jiggling in clear view excited and mesmerized customers, delivering the intended effect. We passed them boxes of luscious buttery popcorn, they handed over their cash. If more persuasion was needed, the sights, sounds and aroma did the rest to keep the customers coming. While the popcorn popped, the soda machine operator poured the soft drinks – ice in a cup, pull down a lever, fill them with syrup and add carbonated water. Getting the fresh popcorn and drinks out on the service counter meant the concessions area was ready for business. While Craig and I helped the girls prepare the concessions area our projectionist, Sid arrived through a side entrance with heavy cases of movie reels. He dashed up the balcony stairs and through a side door to the projection booth. Viewing ports next to the projection lens provided a clear view of the entire theater. Ticket sales escalated as curtain time drew near. Customers waited in two lines; one to purchase tickets, the other to get in. Crowds were often restless, always eager to rush the doors for the best seats. No one wanted to get in their way. A pushy mob is dangerous. Unlatching the door was tricky, the only barrier to a stampeding hoard. One instant after the doors opened, the Esplanade’s aura resembled a midway of yelling, pushing thrill seekers. Parents of the teens dropped them off wanting a break and time to themselves. Things settled into a normal routine once the mob became a crowd again. As one of the ushers, my job required more than escorting guests to their seats. Besides clearing obstructions from the aisles, looking for items of clothing, money, wallets people may have dropped in the dark, we provided a broad array of services on request. During my rounds, I directed a flashlight beam where needed, sometimes helping those with night blindness or pointing out objects someone might trip over. Ushers are charged with maintaining order. Most of the audience is young and must be reminded they are not in a school yard. We spent more time controlling unruly kids than we should have because many would not cooperate. Rebels needed to be escorted from the auditorium. One lad when asked to quiet down one refused. I escorted him out the way my mom would have; by thumb and forefinger. Those two digits work rather well when clamped to the offender’s ear. It’s amazing how cooperative he became when in my grasp. I took him straight out the door and told him not to come back. By contrast, I greeted an elderly woman waiting at the back of the auditorium and helped her to a seat. She wore a pleasing fragrance of expensive cologne and fresh body powder. When I greeted her she politely requested an aisle seat. I offered her my arm and led her to a seat, shining the flashlight on the floor, giving her time to sit and get settled. Glancing toward the balcony, I noticed a young woman leaning back in her seat, ankles elevated and pink penny-loafers crisscrossed on the armrest in front of her. When she realized I noticed her, she became defiant. I looked away for a moment hoping she would take her feet off the armrest. Still no response. She knew her actions violated theater rules because of the signs posted everywhere. Her behavior distracted other guests and her actions were damaging the furniture. I felt the situation reaching a flash point. She remained defiant. Even her outfit screamed anarchy: gold and black striped sweater, patent leather belt, pink miniskirt. Approaching her, I spoke clearly. “Please place your feet on the floor, Miss. You know the rules.” A primal stare was her answer. I stepped back as her rebellion escalated into rage. In an instant, the vixen bared her teeth, cheeks flushed; her eyes ablaze and nostrils flared. Her knuckles turned white as she gripped the armrest berating my efforts to reason with her. I left in frustration and retreated down the steps away from her childish display – let her gloat, convinced she’d won the day. I fought hard to control the adrenaline surging through my body. Down in the main auditorium, I composed myself, considering my next course of action. A moment later I called Craig, the other usher over and directed his attention to the girl. I asked him to keep an eye on the girl while I informed Mr. Machen of the situation. A few days earlier he provided instructions on actions to take when a situation got out of hand. I knocked on his office door. When he asked me to come in I briefed him on the problem. He asked me to keep him informed. Still trying to calm my nerves, I continued to monitor the balcony when the situation went from bad to worse. The vixen’s boyfriend arrived with an entourage of six other thugs, with their jet black hair slicked back, black leather jackets and red shirts with collars turned up. They resembled James Dean. Their jeans were all cinched by studded leather belts. The leader wore black boots with silver tipped toes. West Side Story meets Gentleman’s Quarterly in the early ‘60s. The guy swaggered toward me, an usher with a crew cut. Guido. Surely it was some such name. He closed in, his snarling, menacing face staring under a twisted brow; his pursed lips twisting into a sneer. The gang of six formed a semi-circle behind me curving from left to right. Rigid robots awaiting orders to pounce, shifting like snakes to intimidate a clean-cut kid in their way. I was nearly at wits end when, Mr. Machen called out to Guido. “Put the knife down and step away!” The boss then opened his jacket where a 1911 Colt 45 ACP semi-automatic pistol gleamed in his shoulder holster. About the same time, sirens screamed in the distance. Guido and his gang turned pale at the sudden reversal. Watching the scene unfold below, vixen bolted down the stairs on a determined trajectory to the west EXIT sign. Guido and his cronies fled behind her into the arms of the police. We never saw Guido, his gang or the vixen again. “Let’s go to my office,” he said. I thanked him and headed home, tired and in shock thinking on what might have been. I continued working at the Esplanade, as did my friends – Craig the other usher, Karen, Roberta who worked concessions, and Jill our ticket agent. Sid, our projectionist along and Mr. Machen, may have saved my life. I stayed on until June of 1963. Events of the night gave me enough sobering reality to last a lifetime – all because one girl and her guy were bent on a life of rebellion. I gave Mr. Machen notice letting him know of my active duty commitment with the Navy. I never saw my old boss again but will always have fond memories of the man and the Esplanade Cinema. He ran a tight ship, hired good people and took care of them. The couple in black – Guido and his vixen; my hope is they turned their backs on their rebellious life style and pursued a better life. Some rebels eventually do, becoming pillars of the community. Others go from bad to worse. Some go to prison but some die because they never learned. A month after graduating high school I packed up and hopped a Sante Fe passenger train, eventually arriving at the Great Lakes Naval Training Center in North Chicago. There I worked and studied. Six months later after graduating from electronics school I headed home. I was getting my medical records at the base infirmary on November 22, 1963 when terrible news blasted over the loud-speaker– “President John F. Kennedy has been shot in Dallas.” A hush fell over the room, everyone in stunned disbelief. Confusion reigned. All hung their heads in sadness and many said prayers as we shuffled toward the exit, each continuing on to our respective destinations. The train ride home was a long one. I slept most of the trip, too depressed to do much else. Two days later the train arrived in Dallas. Something caused a delay as the train slowed to enter the station. Later we learned the Lee Harvey Oswald shooting took place in the county jail near Dealy Plaza where President Kennedy was shot on Friday. A few months later my ship patrolled Pacific islands like Iwo Jima, Saipan, Tinian and Truk Atoll where only twenty years earlier US forces fought bloody battles against the Japanese. Not quite a year later we patrolled the shore line and estuaries of South Vietnam; part of the blockade known as Operation Market Time. The US was up to its ears in another bloody war. The Vietnam War lasted most of another decade. I lost friends and comrades at arms in Vietnam. Their memories still haunt me. Looking back, my problem at the Esplanade added another check mark on my list of painful lessons and another cause for reflection. Those were hard times for me. In the span of three years of my life I lived through the following: an assault at the point of a knife; lost my dad, a survivor of the attack on Pearl Harbor, retraced World War II battles and engaged an enemy at war. My outlook on life took on new meaning as a result. If you have a similar story or other contribution please leave a comment. This is a work of fiction. Any resemblance to real or fictional characters is purely coincidental. Ahh. A star is born! I am humbled by your kind words. Your coaching and coaxing made this possible. Lovely piece of writing and I really felt I was there with the popcorn, eau de cologne and the sweat from the thugs. Good stuff. Coming from the author of Echoes of Life and Love short stories, the historical adventure The Crossing and the stellar mystery The Assassins’ Village; that is quite a compliment. I thank you and I wish you continued success. You are welcome and once again. I owe you. Rich, I enjoyed the journey back to movies at the local theater. Our theater was called The Rivoli. I never thought about it before but I don’t know how the name was chosen for a small town on Lake Michigan. Now I’ll probably have to write a story about the theater’s namesake in Italy or France after the war. Your descriptions are vivid and had me drooling over the buttered popcorn. At the movies, I always get buttered popcorn, Junior Mints, soda, and a foot-long hot dog. Probably to make up for the nickel I had for a peppermint stick back when. Your story comes full circle with this ending: Just over a year later I was on my ship in South Vietnam patrolling the shore line; part of the blockade known as Operation Market Time. This was the start a war that lasted nearly another decade. Looking back, my problem at the Esplanade had lost some of its significance. I was never in the military. My protagonist’s background is in recognition of the many nurses who served in wars since WWII. Thank you for your generous and detailed comments. This story came by thoughtful reflection. The end had its intended effect. Our lives and experiences bring bizarre twists of fate. I applaud your recognition of those nurses who served in WWII. My dad was a Pearl Harbor Attack survivor who served for the duration of the war. Those who fought and sacrificed for freedom deserve ongoing recognition for those sacrifices. Their wounds kept the nurses you mentioned busy until the war ended. You are a photographer too? I can see the photog’s eye in these breathtaking details of the story. well done. Rich what an amazing & lovely story. It reminded me of my beloved film “Cinema Paradiso”. While reading I could see the cinema, the characters I could smell the popcorn. Your writing is very visual . This is such a wonderful story! I love the picture you paint of the the 1960’s; the penny loafers, the greasers…. I look forward to more of your reflections! Enjoyed the story. Brought back memories from the sixties of the old theater I used to go to in Crown Point, Indiana. Never had run ins with gang toughs. Everything was simple, peaceful, and all about seeing the movies–always a double feature with a cartoon.